Facilities need a fast and efficient way to apply their nutritional, product or patient information labels on bottles. Bottle Wrap solutions are used in a variety of industries. From small micro-breweries to large cosmetic companies, bottles of all sorts and sizes need identification and marketing material wrapped around their products. Panther Industries utilizes the flexibility of our print solutions to accomplish the bottle wrap needs of our clients. 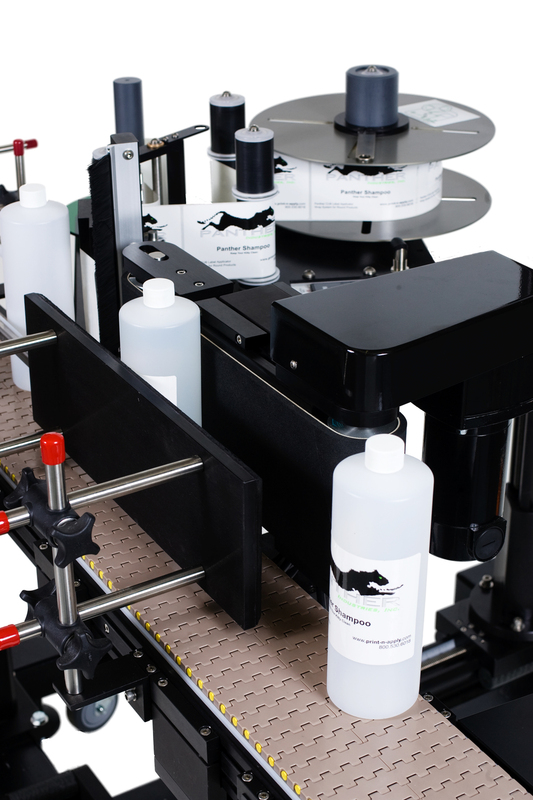 This introduces us to the Panther Industries bottle wrap label applicator. Dispensing labels onto a universally sized bottle with a wrap station allows the applicator to place labels onto bottles that may have minor variance in size, different fill levels or weights. Our uniquely designed bottle wrap applicator also allows increased throughput. Customers using our high throughput bottle wrap applicator have been able to greatly increase their production speeds and also increase the consistency and quality of the label application. This results in a uniformly more appealing product. By moving to an Panther Industries automated bottle-wrap applicator the customer also gains the benefit of minimizing human interaction and possible related errors.